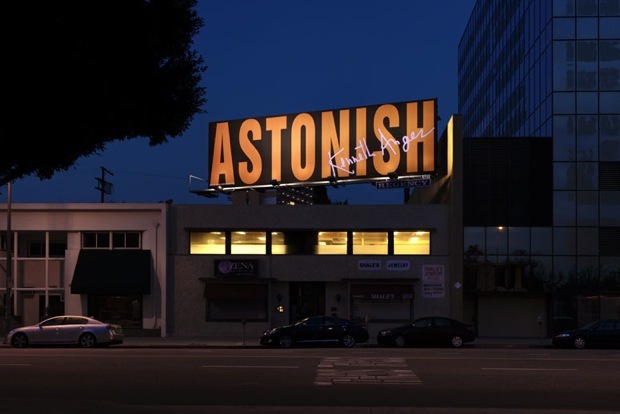 A new large-scale exhibition by the MAK Center turns L.A.’s ubiquitous billboards into public artworks. 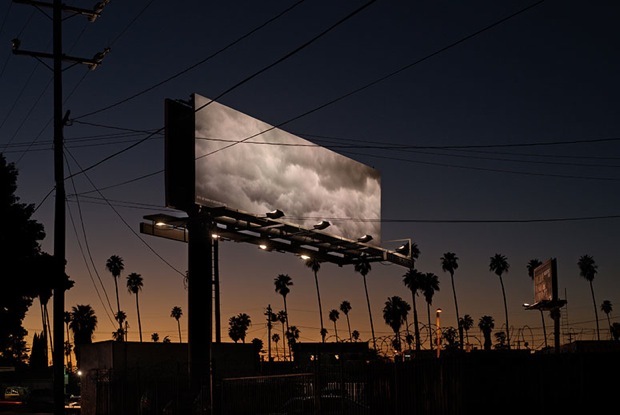 From the hundred-foot supergraphics that coat historic buildings like Christo sculptures to the garish digital screens that cast a sickly glow over once-dark neighborhoods, Los Angeles seems to be losing a battle with ugly billboards. So the timing of a new large-scale urban installation that replaces mega-ads for McDonald’s Mac Snack Wraps with works of mega-art by Kerry Tribe (above) couldn’t be better. 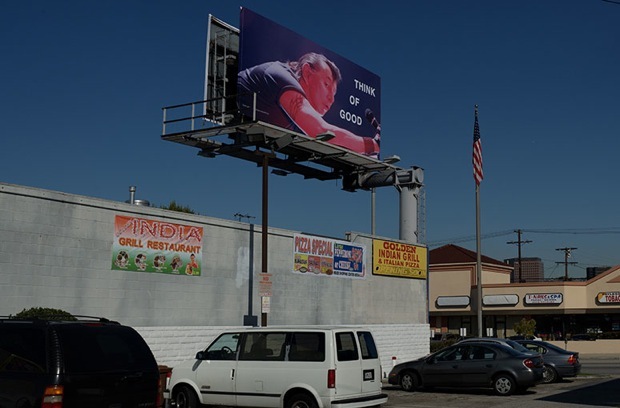 21 billboards will be up by the end of the week, covering a wide area from Beverly Hills to MacArthur Park, Sunset Boulevard to the 10 freeway, and almost every major thoroughfare in between. On last night’s preview ride, a group of about 25 people were able to easily see seven in two hours–including two back-to-back works by David Lamelas and Yvonne Rainer that both played upon the concept of “good.” Lamelas’ piece (above) is part of his “aging rocker” series and features himself as a young punk. Rainer’s piece (below) uses a quote attributed to Marlene Dietrich in her 80’s and seems to respond appropriately to Lamelas’ image. 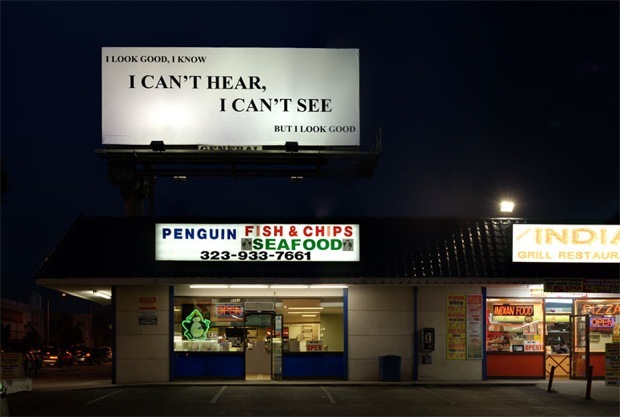 Most of the ads will be up through March–unless, of course, a still-sagging economy prevents them from being swapped on schedule; everyone on the bus acknowledged they’d seen ads sticking around Los Angeles for movies that had long since left theaters. Bus and bike tours organized by the MAK Center will begin next weekend, and a map of all the billboards also allows hardy urban explorers to locate the billboards on their own.